The 2014 Jack Nicklaus National Player of the Year Award recipients, recognizing the top players at the Division I, II, III, NAIA and NJCAA levels, are Patrick Rodgers of Stanford University, Bobby Holden of the University of the Redlands, Oklahoma City University’s James Marchesani, Barry University’s Adam Svensson (not pictured) and Central Alabama Community College’s Tim Walker (not pictured). 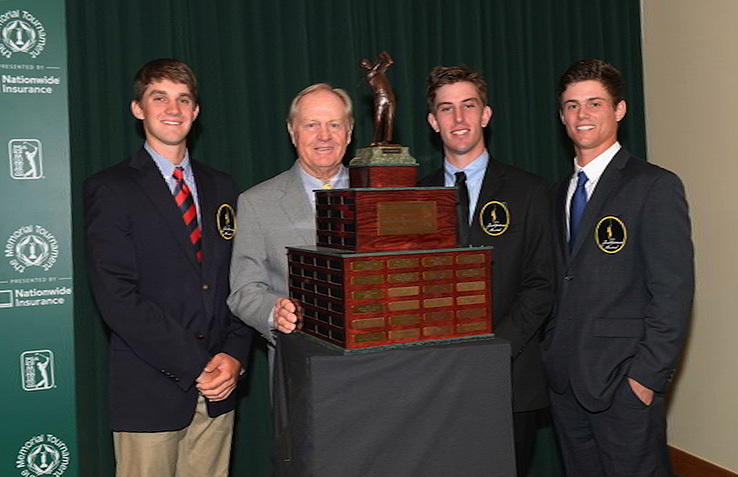 Dublin, Ohio — Patrick Rodgers of Stanford University, Barry University’s Adam Svensson, Bobby Holden of the University of the Redlands, Oklahoma City University’s James Marchesani and Central Alabama Community College’s Tim Walker have been named the 2014 Jack Nicklaus National Player of the Year Award recipients. The Nicklaus Award recognizes the top players at the Division I, II, III, NAIA and NJCAA levels. Division I: A junior from Avon, Ind., Rodgers had six collegiate victories in 2013–14 and tied Tiger Woods’ all-time Stanford record for career wins (11). His season victories have come at the Erin Hills Invitational; The Goodwin; Southern Highlands Collegiate Masters; The Prestige; Pac-12 Championships; and NCAA Eugene Regional. A three-time PING First-Team All-America selection, Rodgers boasts nine top-10 finishes this season. He also won the Ben Hogan Award and was named Pac-12 Player of the Year. Rodgers led Stanford to the NCAA semifinals posting a 2-0 record in match play. He is Stanford’s first Nicklaus Award recipient since Tiger Woods in 1996.